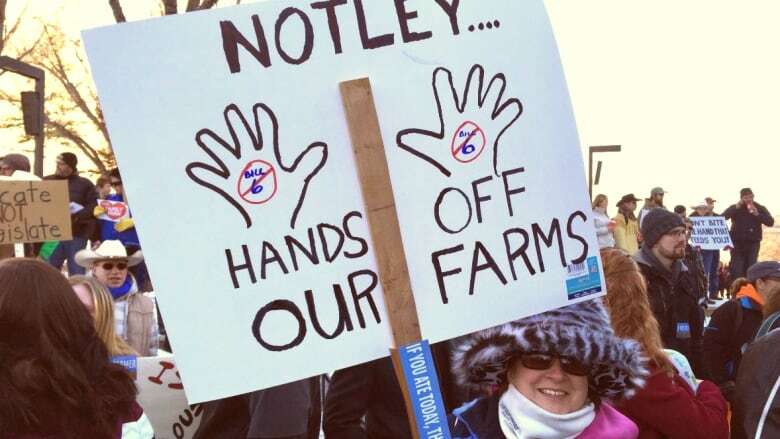 The head of a new coalition of 28 agriculture producer groups in Alberta says it would be a mistake for UCP Leader Jason Kenney to repeal Alberta's farm safety law if he wins power next year. Albert Kamps, chairman of AgCoalition, said the industry has worked closely with government over the past two years to craft rules that work for farms and ranches. "To roll this all back would need a lot of consultation, because we'd be throwing out a lot of good with the bad," Kamps told reporters Wednesday. "At this point, I think we've landed in a good place and I'd be against blindly rolling it back." Kamps, a dairy farmer from Lacombe, joined Labour Minister Christina Gray and Agriculture and Forestry Minister Oneil Carlier at a news conference to announce the second phase of the law, still commonly called Bill 6, which comes into effect Dec. 1. Alberta has made 17 exemptions or changes to occupational health and safety rules that will apply to the province's 4,200 farms and ranches. Every farm or ranch that employs paid workers who are not family members must perform a hazard assessment. The controversial farm safety act passed in late 2015 after weeks of protests. Farmers and ranchers complained they were not told about the changes which they worried would prevent children or neighbours from helping out on farms. Kamps thinks the consultations will help increase buy-in from farmers this time around. The 2015 protests were sparked by a lack of knowledge or understanding about what was in the bill, he said. Discussions between stakeholders and the government mean the occupational health and safety rules have moved from being technical rules to more common-sense regulations, he said. Kamps's organization, AgCoalition, created a new entity called AgSafe, which is intended to help farmers and ranchers with the transition. The groups represent 97 per cent of producers in Alberta, he said. OHS officers with knowledge of the agricultural industry will be available to help as well. The government will provide a $170,000 startup grant to the organization, which will eventually be funded through the industry, much like other safety groups, such as the Alberta Construction Safety Association. The government will provide grants of up to $10,000 to farmers and ranchers to help replace or modify equipment, perform safety assessments or provide safety training for their workers. None of the rules will apply to farms whose only workers are family members. Children will still be allowed to work on their parents' farms or ranches without any legal limits. There are about 14,000 agricultural workers in Alberta who are not related to their employers. The OHS rules will apply to roughly 10 per cent of Alberta's 40,000 farms and ranches. On Wednesday, Jason Kenney said his government will continue to oppose most of the changes. Kenney said the UCP would repeal the bill if elected. One exemption will allow workers to ride on older farm equipment that lacks seatbelts, as long as other safety measures are taken, such as driving slowly. Farmers can continue to use or sell their existing equipment. The government didn't adopt a recommendation from a fatality inquiry report into the 2014 death of Stephen Gibson on a farm near Cochrane. Gibson died after his clothing became entangled in piece of farm equipment called a power take-off, or PTO, which was about 40 to 50 years old. The judge recommended the Alberta government introduce mandatory annual safety certification for all farm equipment. Gray said having engineers inspect equipment is not "reasonably practical." "What we have done is gone from no rules on farms and ranches to now some code changes where hazard assessments will need to be completed, where someone competent will need to give direction to a waged farm employee on the safe use," she said. "This is going to help improve safety, prevent incidents and accidents. And it's a reasonable step that farms and ranches are going to be able to take." The first phase of the Enhanced Protection for Farm and Ranch Workers Act came into effect on Jan. 1, 2016. It extended workers' compensation to paid agricultural workers who were not family members. More than 1,860 agricultural workers have had WCB claims accepted since then. After people in the agricultural sector complained about a lack of consultation, the government set up four working groups to examine the OHS code in detail and make suggestions about what would work. The government then put that feedback out for comment from October 2017 to the end of February.